Where’s the Sweetness in Parting? Perhaps nothing illustrates the passage of time more than looking back and realizing where you were and what you were doing two decades ago. Domer at that time was a wee lad, and we decided to plant a Sugar Maple right in the front yard. To watch it grow as little Domer grew, to enjoy its shade as we enjoyed his sunshine. The seasons came and went, and Domer’s tree became stunning. Perfectly shaped, tenderly nurtured through droughts and ice storms, its leaves gloriously red with every autumn. This week, a sudden thunderstorm came up. Winds estimated at 70-80 mph — driven by a cold front — snatched at utility poles, snapping them like matchsticks and blanketing us in darkness. Domer’s beautiful tree was lying on its side, looking as if some immense beaver had sneaked into our yard, felled it, and slunk off into oblivion. Once the storm passed, I went out to assess the damage. 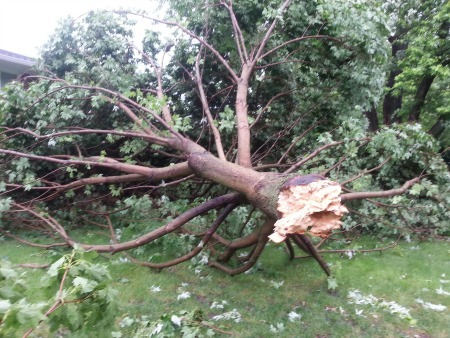 A maple in our back yard had a large limb hanging like a broken arm and sweeping the grass. Our neighbor’s trees had lost MANY limbs, most of which were scattered across our driveway…or on top of the power lines out back. No TV. No computer. And a phone in dire need of charging. Not to mention HOT. It was 91 degrees outside with a “feel like” temp of 101. No air conditioning; no fan. Rather like surviving a hurricane, only blessedly shorter. In all, our community lost 60 utility poles, with thousands of residents inconvenienced. We didn’t get electricity back until nine hours from the time it kicked off. Hurts to look at Domer’s once-beautiful maple, doesn’t it? I texted a photo to Domer, and he was amazed. He had no idea we’d had such severe weather. Now you know why I’ve been away for a little while. Not having much fun, obviously, but taking care of business. This entry was posted in Seasonal and tagged bad weather, sudden storm, sugar maple, tree. Bookmark the permalink. Aw, what a shame! The tree was so lovely too, not to mention its associations for you! Perhaps you could save a piece of it in some way? Do you know anyone who carves or works with wood? I’m glad you weathered the storm and came through safe, though. FF, we’re on the same wavelength. I, too, considered saving just a wee piece of Domer’s tree, but when I broached the suggestion to him, he turned me down. This “Throw-Away Generation” doesn’t value saving for sentimentality’s sake! So when the tree guys came to haul it away, I made an appointment so I wouldn’t have to hang around and watch. Cowardly, huh?! I’m so sorry for the loss of Domer’s tree. 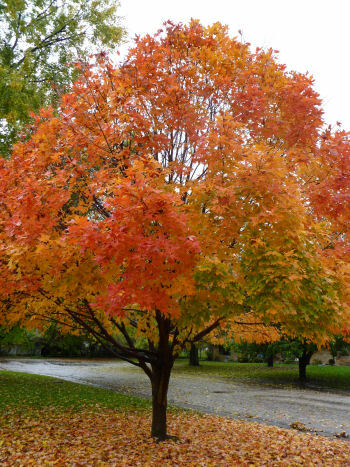 It would be a good idea to go and get another and plant it in memory of that beautiful maple. Definitely considering which kind of tree would work for the open spot, John. The front of the house really looks bare right now, but we’re blessed we didn’t get any more damage than the demise of Domer’s tree. Oh Debbie that is just heartbreaking. I know those winds so well and the destruction they can wreck. I’m with the Fiction Fan, can you turn the wood into a carving of some sort? And just maybe, plant another tree? Aw, thanks for the sympathy. I’m researching which kind of tree to plant, though the tree guys said we could just leave the spot bare. Really?? I don’t think so. And now that they ground out the stump too, it just looks yucky! Thanks :-) yes those years fly! Thanks, Cindy. I remember when it was little and I’d stand beneath it on a hot day, giving it a long drink of water. It was an excellent shade tree! And it would be the same for me, Debbie. I feel so sad and heartbroken whenever I see nature destroyed; especially trees because they’ve been standing there so long; contributing so much to life on this planet. I think of trees as almost people; having feelings and emotions. And a soul. So it makes me very sad to see them destroyed. Having lived in Florida for so many years and going through MANY hurricanes, I know the destruction they can bring – the water and wind damage, and the loss of electricity for HOURS and HOURS. Glad to hear that you got your power back on. And I really liked FictionFan’s idea about saving a piece of the tree and having it carved or made into something to hold the memory. Thank you for understanding, my friend! Love this statement: “I think of trees as almost people; having feelings and emotions. And a soul. So it makes me very sad to see them destroyed.” Me, too!! Trees give us so much — shade on hot days, beauty with their fall dresses, homes for birds and squirrels — and ask so little in return. If I’d had any idea Domer’s tree was going to snap in two, I’d have tried to save it (though what any human could have done against winds like that would have been minuscule). Mother Nature’s fury is nothing to play with! I, too, am awfully glad to have electricity again. We think we can adapt pretty well (and most of us can), but baking in 90-plus degree heat — with no air moving around — is dreadful. We’re so spoiled, ha! It’s always sad when this happens. Down here, it’s one reason the tree guys and garden guys and home repair guys always counsel tree trimming before hurricane season — to give the wind less to work with. Of course, your situation is quite different, and I’m sure that the kind of interior trimming common here isn’t at all common up there. But, as your next tree grows, you might ask. I’ve heard that you shouldn’t put a new tree back in the same spot, either. I suppose the roots from the old tree are so well established, it would hinder the development of the new one. But I’m no tree expert. What I am is sentimental, and it would pain me to be in your situation. Heck, I feel sad when a pigeon lands on one of my prickly pears and breaks off a pad! But i’m sort of with Domer on this one. Away with the old, and in with the new! 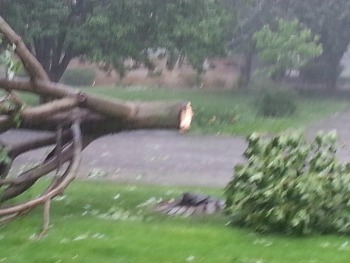 Our tree guys haven’t said word one about pruning before storms, but it makes sense to me. Looking back on it, Domer’s tree was rather “top-heavy,” and a trimming might have saved it. As for planting in the same spot, that stands to reason as well. So if we do decide to plant anew, we’ll choose a spot a bit farther from the house — just to be on the safe side! Domer would thank you for agreeing with him, despite the sentimentality over his tree, Linda. After all, he’s the one who’d put Hallmark out of business because he generally refuses to buy cards for occasions. Sigh. I tried, really I did, but he prefers a phone call…and that’s just fine as long as I hear from him! How awful! My heart goes out to the tree and to you and Domer. Parting is such sweet sorrow after all. Love the quote. I can apply it to a situation I’m having. My cousin and her husband and son moved here 6 years ago. I hadn’t seen her since we were children, but we soon became close, doing all sorts of things together. I loved the feeling of having family here, people you could count on etc. Well just last month they announced they’re moving away because they can’t afford to live here in California anymore (it’s crazy expensive here, I grant you that), but their imminent departure is killing me. It’s certainly not going to be the same. I sympathize with you, Monica. Seems that’s one of the hardest things to accept about our mobile world, the fact that people don’t always stay where they’re planted long enough. But look on the bright side — now, you’ll have friends in another place to visit! Assuming, of course, that they relocate somewhere you’d like to travel to! So sorry about the tree. Yes, I understand I have a few trees I hold dearer than others just because someone gave it to me or planted it, and losing one of them (my mandarin tree) was quite sad for me. That was one crazy storm that passed through! Did y’all get some of it, too? Hope everything survived! Thanks for sympathizing with me on Domer’s tree — I guess we allow ourselves to get more attached to things than is good for us. We had gotten a bad storm I think on Thursday night, but beautiful weekend. Oh Debbie – so sad to see this beautiful tree go. And sorry you’ve had to weather such a storm. Hope the clean up is done and perhaps a new sapling planted in her place soon. I love the Kahil Gibran quote but am sure you loved that tree every time you saw it while it was living and near. I’d have liked that tree on its own, but its connection to Domer made it extra-special. Cleanup is done; now, we’re debating the pros and cons of planting a new tree…and what kind to plant!